The past month saw little change in the value of my stock portfolio or SMSF, as the markets dropped mid-month and had only just recovered to the previous month's close by the end of August. On the other hand, Sydney property prices have continued increasing, so my overall net worth got a boost from two month's worth of increase in the valuation of our home (as the monthly sales data were not available when I did last month's net worth calculations). 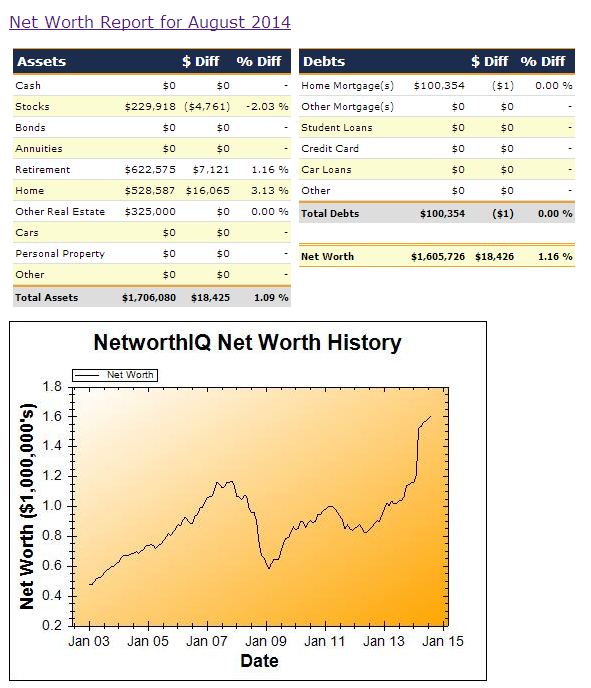 Overall my net worth increased by $18,426 - which seems impressive until you realize that simply keeping pace with inflation (around 3% pa) would require a monthly rise of over $4,000.